Remember when Sunday dinner was the norm? Mom or Grandma made a nice dinner (meat, potatoes, veggies and dessert). Family dynamics have changed over the years and so have eating habits. Next time you can get the whole gang gathered around the table, make the most of the event. 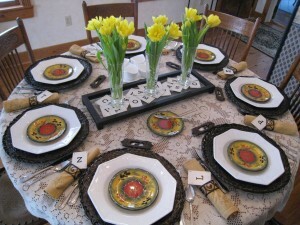 I think about design every time I set the table or advise a hostess. Sometimes you get inspiration from the interior design of the dining room. Other times the event sparks an idea. Most often a color or a particular dish is the launching pad. My son’s new girlfriend was the guest of honor at last Sunday’s dinner. 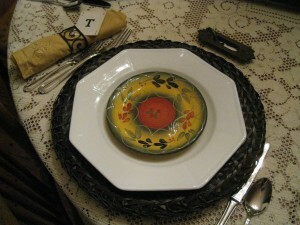 The hand painted Tuscan inspired plates were a gift and I decided to pair them with basic white dinner plates. You know how much I love contrast. It’s important in any interior design scheme. It’s also necessary at the table. 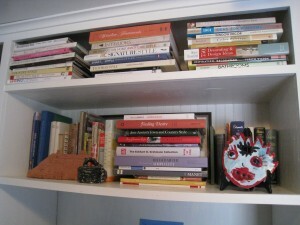 Etiquette dictates there should never be an empty space before a guest. That’s why chargers are often used. When the dishes are cleared away there is still something pretty in place. 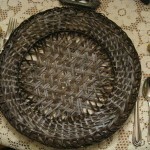 Woven wicker chargers provide the appropriate contrast with the white plates and lace table cloth. I coordinated the rest of the table accessories with the dark stain on the chargers. Napkins are rolled into metal rings. To avoid playing musical chairs, it’s important to assign seats even at a family gatherings. 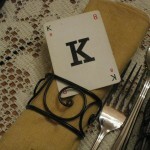 Instead of place cards, I found an old card game with initials and tucked one into each napkin ring. 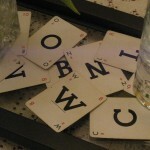 The rest of the cards were scattered on the centerpiece tray (also dark bronze). What can I say? 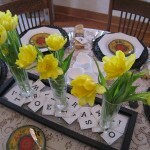 Its tulip season and they will grace every table I set until they are no longer available! Salt cellars have been used at very formal and elegant dinners for centuries. Traditionally you would find small glass or silver bowls with tiny spoons for serving at each place setting. Today we use salt shakers at informal meals. I love the challenge of finding new uses for found objects. This is one of my favorite ideas. 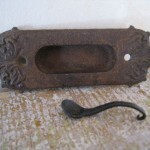 I picked up these old pocket door pulls at an antique store. They are perfect for salt. 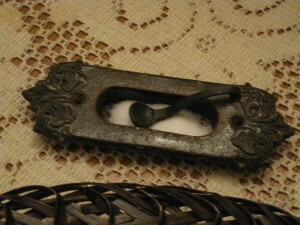 The little spoons are made from old nails match the bronze finish. I purchased them in Coloma, California where gold was first discovered. It’s not the table setting or the design or the food that makes a dinner party successful, it’s the people gathered around the table. Invite your family this weekend! 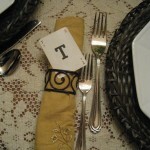 Loved your post & your tablescape. Loved all your ideas. Now I know why we have chargers on our table. I learned something new today. 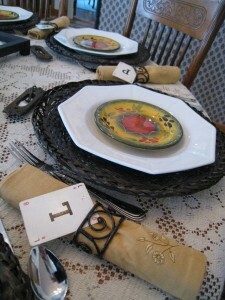 I love your table….so creative! Love the way you used the cards and the door pulls. Looks great! 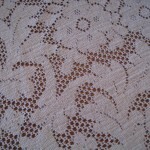 Love this table –it’s so pretty, and complete down to the last detail. Great look. And your salts are a great re-use of something else — brilliant! We always got out the china for Sunday dinners. Love the table. Very special. What a wonderful table. LOVE the salt cellar idea!